Cut Green tomato into medium pieces. Cook it covered by adding 1/2 cup water, green chiles , salt to taste, till it is tender to fork. Meanwhile grind grated coconut, garlic , green chiles and turmeric powder to a fine paste. Pour this to the cooked green tomato and Bring to boil, and simmer for 3-4 minutes, stirring often and remove. OOHHHHHHH! I love any dish with green tomatoes! Slurp! I will this try when I get green tomatoes:) Beautiful and neat photos!! Just now commented about this curry at lissie'space,looks awesome! I always look for green tomato recipe as thats what I get from my kitchen almost all year around. this one is a keeper and am gonna try it tomorrow itself. Ellerinize, emeğinize sağlık. Çok güzel olmuş. Leziz ve iştah açıcı görünüyor. This is a new curry to me sarah ,worth a try .Pics are superb. 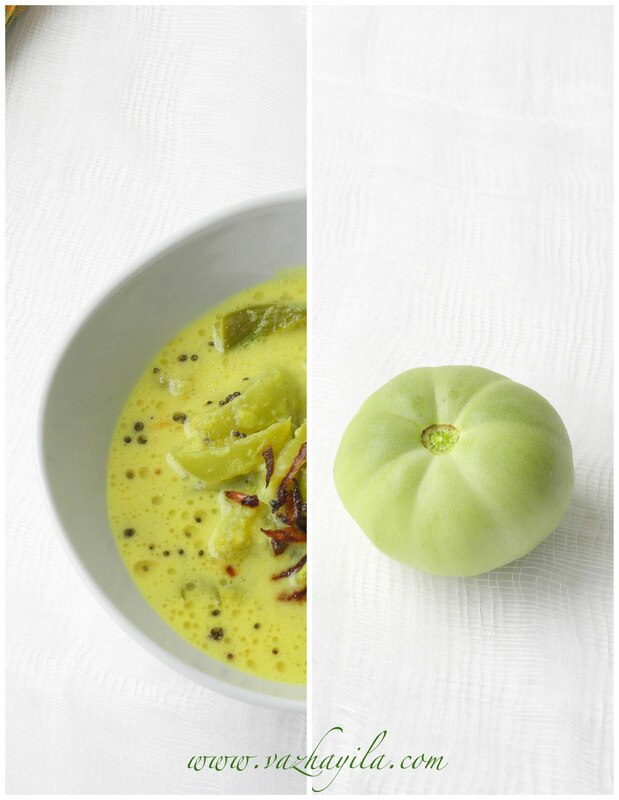 Never tried anything green tomatoes.Sounds interesting..Surely will grab some this weekend and try your recipe !! Very nice and innovative recipe. Looks delicious and I liked the green colour of the curry. Love the gorgeous color of the curry..yummy!! MIL de aduthunu ethine paty kettiundu.kazhichittilla.Yummy curry with beautiful color! Sarah,,ur pics really keep me drooling,amazing blog.It is one of ma fav. Irresistible green tomato curry, lovely clicks..
Really creamy and yummy, beautiful click too..
Green tomato look so tasty and tangy. Clicks look excellent. Nalla color..kandittu eniku vishakunnu..thakali honeyude gardenil undayathuannoo ?? A mouthwatering curry! The clicks are excellent. oooooooooo....drool worthy !! such a mouthwatering dish !! Looking real good! Love the color! Nice color of the curry. Beautiful clicks. Damn tempting curry with beautiful curry..looks delicious. Adipolie.. thenga aracha ethu curryyum eniyku eshtama. Especially thakali.. too good. I had no idea Green tomato curry could look so appetising! Great photos and definitely a must-try recipe. Looks like a great excuse to grow a lot of tomatoes! I love the color of the curry. It looks so delicious. Great clicks too! Attractive pics and delicious chutney. Loving it. This looks awesome. I always need lots of green tomato recipes as mine never all ripen. i look forward to trying this - thankyou! Looks super and never knew of this preparation before, will try it. Just one question - does it have to be absolutely green to make it taste well? What would you suggest in place of the curry leaves if one does not have easy access to the item? Good recipe. I make it with cooked moong dal (cheru paruppu) and it becomes well-balanced!